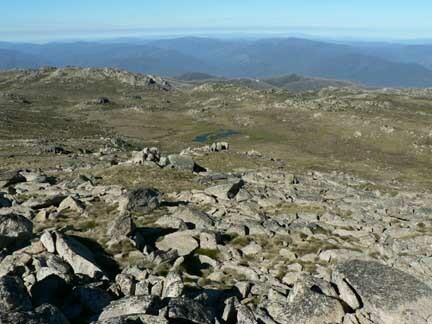 At 2,228 meters (7,310'), Mount Kosciusko is the highest peak in Australia. 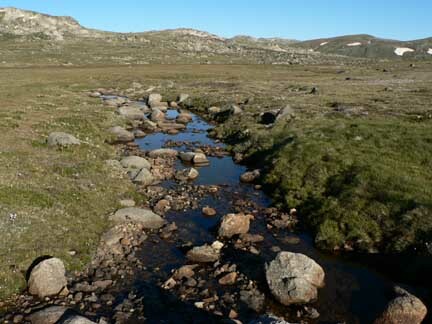 Mount Kosciusko is located in the Kosciusko National Park in the Snowy Mountains of south eastern Australia. It is considered one of the famed Seven Summits by many although that is an oft debated subject among the world's mountaineers as many consider Carstensz Pyramid in Indonesia the true summit of the Australia/Oceania continent. Nonetheless, we were going to be in Australia for 10 days after our trip to New Zealand and Mount Cook and wanted to see the Snowy Mountains and hike to the summit of Mount Kosciusko. Also, it was nice to actually summit something during our three week trip to New Zealand and Australia! The hike turned out to be a wonderful, easy hike among some beautiful high terrain of Australia. We departed Christchurch, NZ in the early morning and arrived in Sydney around 10:00am to some long lines in customs. I quickly learned Australians have a great sense of humor as we stood in the customs lines and were asked by a customs agent to head down the line of queues to help alleviate some of the length of the main line. I said to Allison, without thinking, "Let's go down to the far queue." The female customs agent laughed and said, "I didn't say it!" It took me a few seconds to get the joke I just unknowingly spewed and I laughed all the way down to the "far queue". 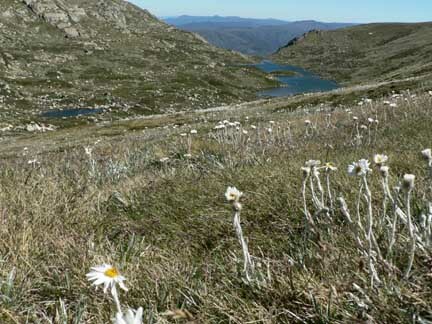 Once we handed our paperwork to the customs agent he asked where we would be staying that night and we replied that we didn't know but planned to be "somewhere in Kosciusko National Park to camp." He gave us an odd look and said, "Do you know how far that is?" We told him yes, we realized it was nearly 6 hours drive and that all we planned to do that day was drive. He took our e-mail addresses for contact information and we were in Australia. We rented a sedan and hit the road with me driving. I was, by now, a pro at driving "on the wrong side of the road" and we immediately hit the motorway and headed south on the Hume Highway towards Canberra. The rental Hyundai Elantra was a way smooth ride compared to the Subaru wagon we had been driving in New Zealand and we made good time. We arrived in Goulburn for a late lunch at the Paragon Cafe. Food prices seemed a little cheaper than in New Zealand and milkshakes are just flavored milk. 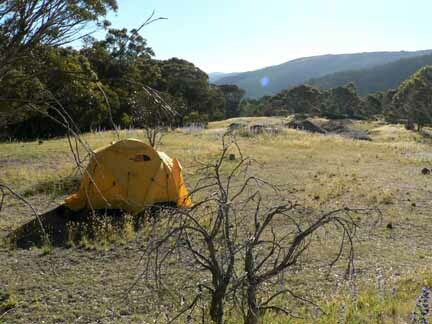 We drove through Canberra and into Jindabyne that afternoon arriving in Jindabyne around 4:30pm in time to talk with a woman at the visitor's center about camping. She suggested some free camping in the Kosciusko National Park and we thanked her. The park entrance fee was $16 Australian dollars so we drove into the park to find a campsite for the night. The official campsites along the road to Charlotte Pass were filled but we managed to find some good bush camping a little deeper down a side dirt road. We setup camp and drove back into Jindabyne for some dinner. Chicken kebabs at a small kebabs restauarant by Lake Jindabyne filled our stomachs for dinner. Every expedition needs a basecamp and every basecamp needs a VE25 four-season tent even if it is 75F degrees outside! We expected the day to warm up quickly so we got an early start on summit day. We broke down our basecamp and finished the drive to the Summit Walk track trailhead at Charlotte Pass by 6:30am. The sun had just risen as we began our hike along the dirt road southwest towards the summit of Mount Kosciusko. One kilometer down, 7 to go. Allison hiking along the road on the Summit Walk track. I was immediately impressed with the amount of snow still left where cornices had formed during winter. There must be a lot of snow in winter and some very huge cornices. The open terrain had me dreaming of the area being blanketed in snow, it must be quite a sight! We appeared to be the first on the trail that day and the temperature was surprisingly cool in the shade. It wasn't long before the sun poked over the small hill to our left bringing with it some nice warmth. Bill obviously had some pent-up energy and hit the road moving quickly and was soon nearly out of view from Allison and I. The road followed the southern edge of the basin that contained the Snowy River and with no high tress around, the view was awesome. The high Snowy River basin with remnants of old cornices still hanging around. We felt as if we were around 11,000 feet in Colorado above the trees but in reality we were lower than the altitude of our house in New Mexico! The hike was gentle and smooth along the graded dirt road and before long we were crossing the Snowy River at the southern end of the basin. A small plaque at this junction explained the river and stated it flowed 500km to the ocean. The start of the great Snowy River. From here the road went up a short hill to the Seaman's Hut, a stone hut named after Laurie Seaman, a hiker who had gone missing in this area in 1928 with five others in poor weather. A testament to the strong winter storms that pass through these mountains. From here we had our first view of the summit now only 3km distant. 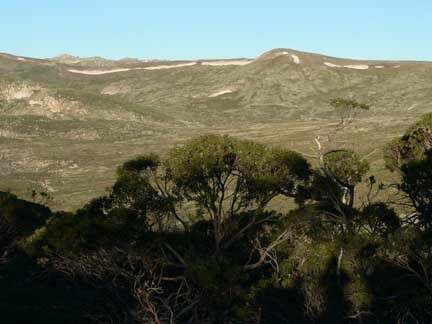 The summit of Mount Kosciusko from near the Seaman's Hut. We carried on enjoying the cool temperatures and expanding views. With each few yards gained we began to get a better view of the surrounding territory. 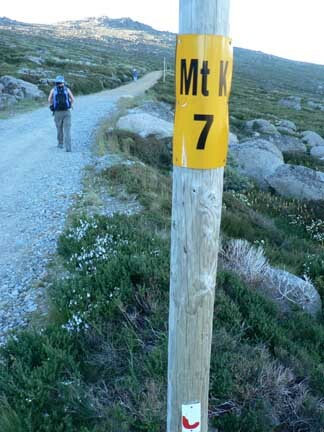 We soon reached the junction of the alternate track that comes up from the Thredbo ski area towards the summit. Hikers seeking a shorter hike can ride the ski area's lift and make the short walk from the top of the lift to the summit. We were still early enough that there weren't any hikers coming up this alternate track. At this junction there was also a group of porta-potties which seems like a great idea given the fragile high-alpine environment here. From here the trail does a near 360 around the summit going counter clockwise. We could see the summit and it would have been a short walk straight up but we're well-trained hikers and knew better than to "cut the switchbacks". And besides, going nearly full circle around the summit gave us some wonderful views to the north and west. Looking north as we pass around the summit on our way up. With the summit in sight we kicked it into gear and turned the final corner to the summit at 8:45am. A plaque on the summit gave the history of the first person to climb and name this peak, a Polish explorer, Paul Edmund Strzelecki, in 1840. 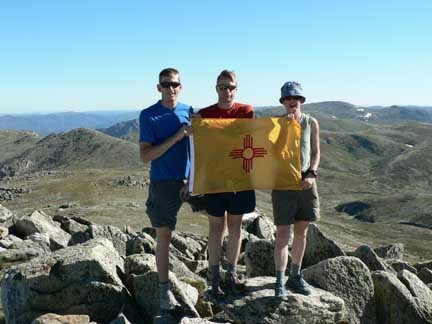 Flyin' the New Mexican flag atop Mount Kosciusko. This summit was Allison's second of the Seven Summits, Bill's third and my fourth. After reading the short history lesson we snacked briefly before realizing just how nasty the flies were starting to become. The winged pests were becoming more intense as the day heated up and we soon decided to head down to get out of the frustrating path of the flies. If it weren't for the flies, it would have been a wonderful summit to relax on and enjoy the scenery. I had more crackers I wanted to eat but I would have to eat on the run. On the descent we opted to take the Main Range Track back to make a nice loop hike for the day. 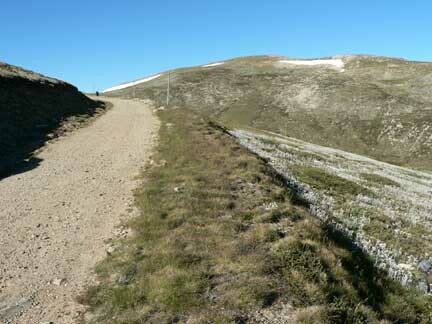 The Main Range Track is a singletrack trail and was more appealing compared to the dirt road. Nice stone steps in critical sections showed that some hard work had gone into this trail. The trail wound between smaller neighboring peaks along the edge of some high basins that contained nice lakes. Beautiful view of a high lake along the Main Range Track. 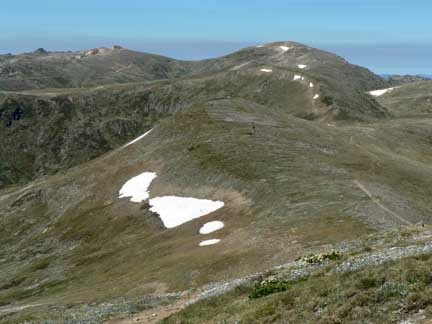 This portion of our loop hike proved to be the most beautiful with great views back towards the summit of Mount Kosciusko and some nice undulating terrain to hike on. But the flies were still nagging and getting old real fast. 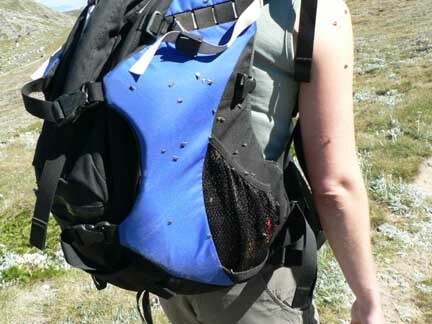 A herd of flies taking refuge from the wind on the leeward side of Allison's backpack . We began to pass a few hikers making their way towards the summit and a number of the hikers were wearing mosquito netting hats. Clever people had been here before! We were envious as we swatted in the air around our heads and kept on hiking. The rest of the hike went quickly as we passed many sections of mountain flowers spread out all over the place. We arrived back at the car just before noon before the temperature got too warm and piled into the car for the scenic drive north along the eastern coast back to Sydney. We wanted to be in Sydney for New Year's Eve to enjoy the fireworks at the Sydney Harbor before doing some climbing in the Blue Mountains just west of Sydney later in the trip. Written by Jason Halladay on 30 January 2006 for TheMountainInstitute.com.